Welcome to the 2008 Blacksheep Warbird Fly-in. 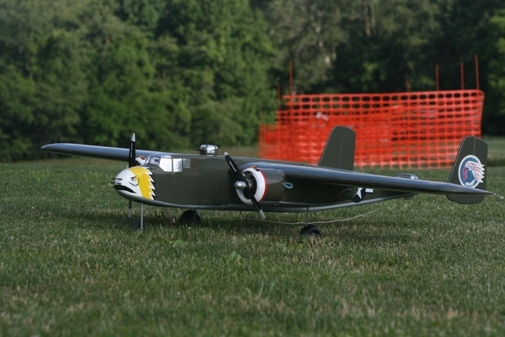 Well, the 2008 Blacksheep Squadron Warbird Fly-In is in the books. 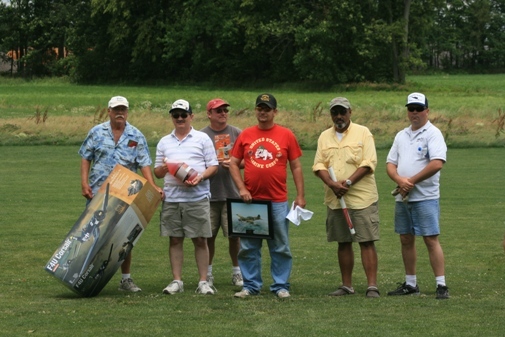 We had 19 officially registered pilots and 40 warbirds. Lots of nice planes. The wind did blow and most of the time at a crosswind to the main runway. Even had a rain shower come through. Despite all this, many made flights. 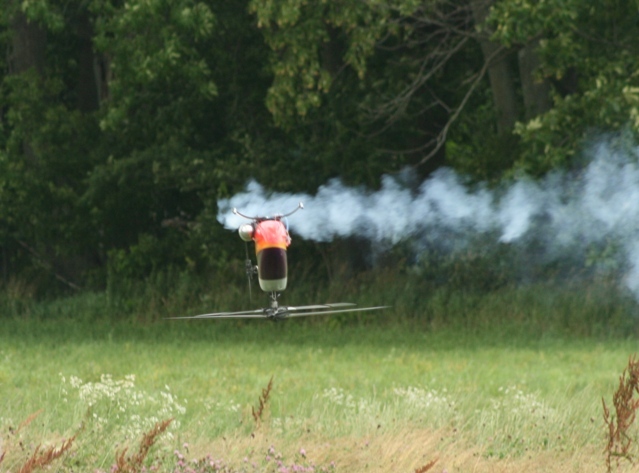 Parker Hall gave a couple XFC style helicopter demos, I am telling you 1 inch inverted with the gusty winds is a real attention getter. 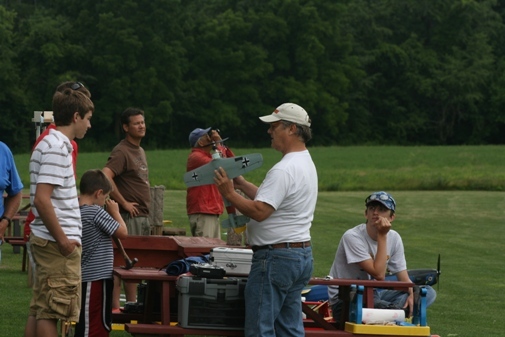 Also, several times during the day, Blake McBee, Dillon McBee, Luke Louden and Parker Hall flew the McBee's stunt kite. Says it takes 25 mph winds to fly, it flew well! Approximately 50 people enjoyed the lunch. Thanks to Brian Baumer and Jonathon Rifken for lending their fine grilling skills. Everyone seemed to get plenty and enjoy a good meal, burgers and dogs, chips, baked beans soda pop and cookies and brownies. Thanks to all the pilots who came and enjoyed our field, it was a pleasure to have the Terra Haaute guys and Mattoon, IL guys come visit. And special thanks to all the Blacksheep who helped out. John Louden, Tom Carlyle and Bob Wernsing did a great job at registration and selling raffle tickets. Wayne Jones and Tom in the frequency impound, Ralph McBee and Deene Vanmeter on the flight line and Blake, Dillon, Luke and Parker for miscellaneous help. Dave Miller for taking care of Peoples Choice and Pilots Choice ballots. And thanks for everyone who brought cookies and brownies for the lunch. Oh yeah, Tony Bowling, Joe Kosiba and Don Trosper for the field prep, the field was in great condition. 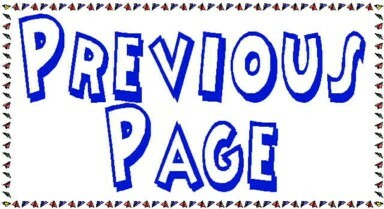 Hope I did not miss anyone. 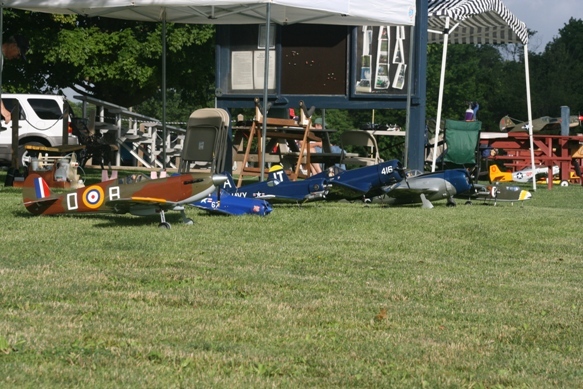 Many planes received votes for both the Pilots Choice and the Peoples Choice Awards. 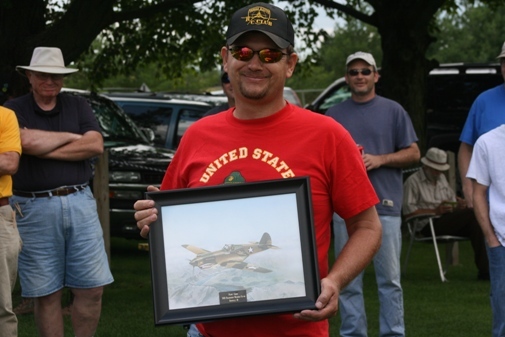 The Awards were a framed lithograph prints of a P-40 Warhawk flying over the Burma mountains. 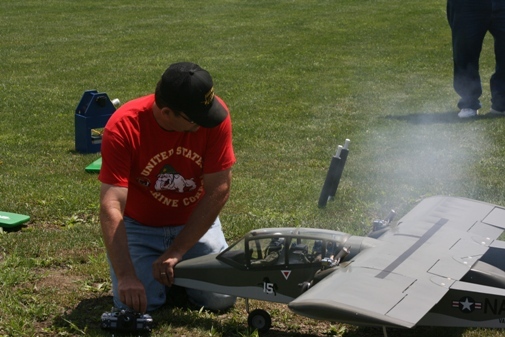 Duwayne Lindsey from Terra Haute won Pilots Choice with his scratch built 80" wing span OV-10 Bronco. 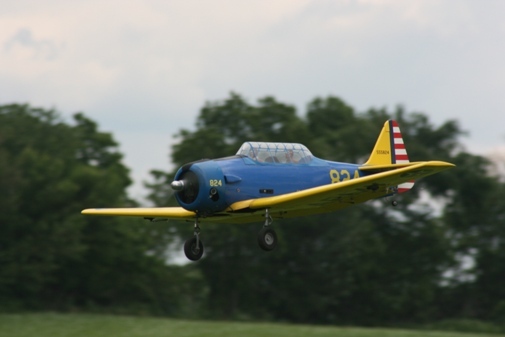 Also, from Terra Haute, was the Peoples Choice Top Flite Corsair, powered by a G-62. 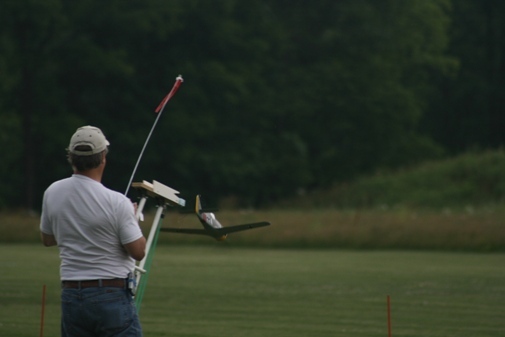 Unfortunately, he lost it during it's first flight of the day. 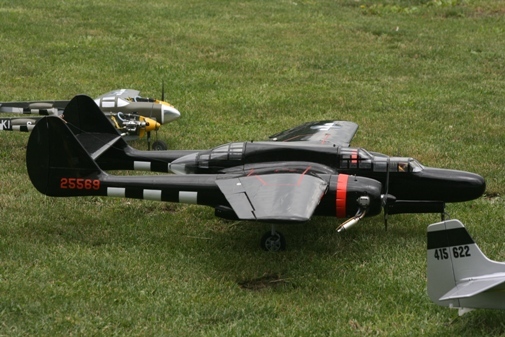 2) Wayne Jones' scratch built B-25. 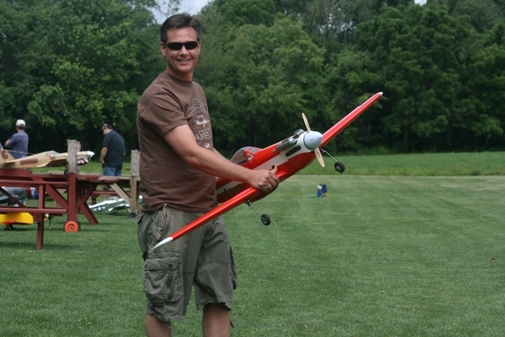 70" wing span and powered by two GMS .32 engines, nothing sounds like a twin! 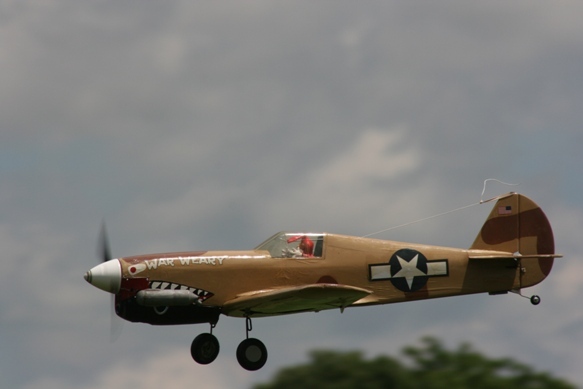 3) Wayne Jones' Top Flite P-47, powered by an OS Max .90. 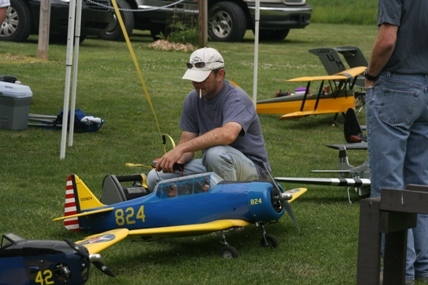 5) Weir Thurman showing his small scratch built electric Folke Wulf F190. 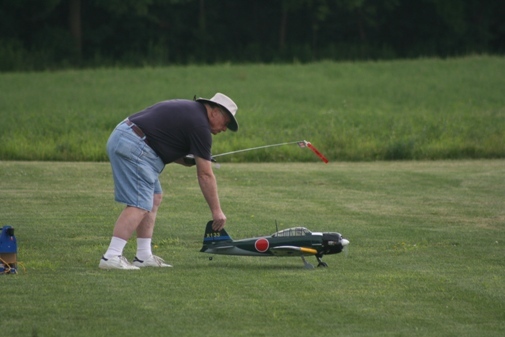 6) Charles "Doc" Gray with Kyosho Zero. Powered by an Enya .53 four stroke, very nice flying. L-R: 1)Weir launching his FW-190 with home made launching devise. It was more amusing than successful. 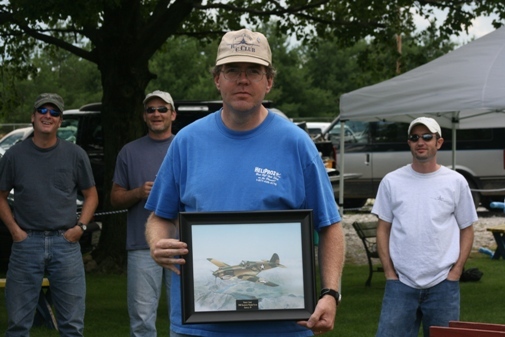 2) Don Schmedake with Top Flite P-40 Warhawk. 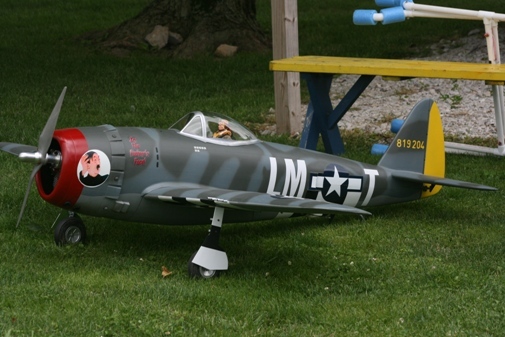 3) Tom D'Arria's Top Flite P-47 Thunderbolt, powered by a G-62, very nice plane. 4) Mitch Baker's P-61 Blackwidow. Very nice plane, powered by a pair of RCV .58's. 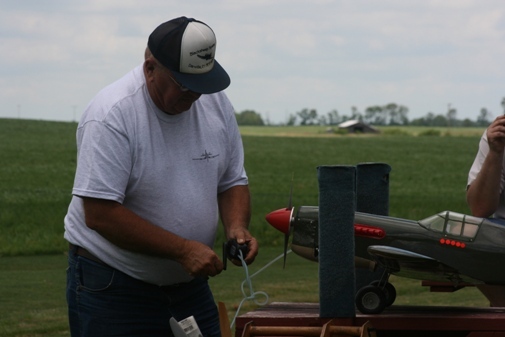 5) Ed Brazzell get his Midwest T-6 Texan ready for a flight. 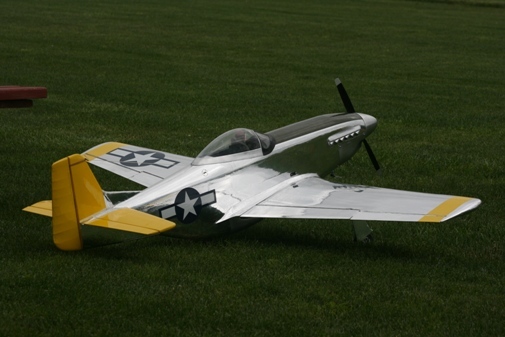 6) Don Presdoff's chromed Top Flite P-51 Mustang, powered by an OS .91. L-R: 1)Duwayne Lindsey taxiing out his Great Planes Tiger Moth, powered by an OS .91, despite high winds, made a great landing. 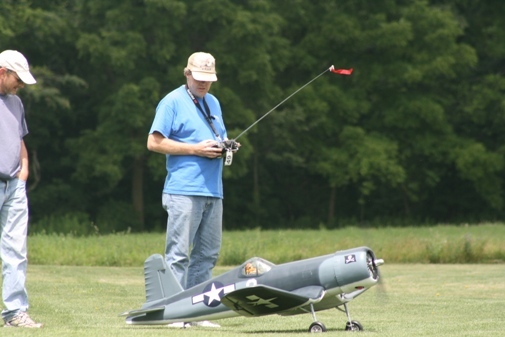 2) Parker Hall assisting John Louden launch his Great Planes 1/12th scale Corsair. Very fast and smooth with an OS .25. 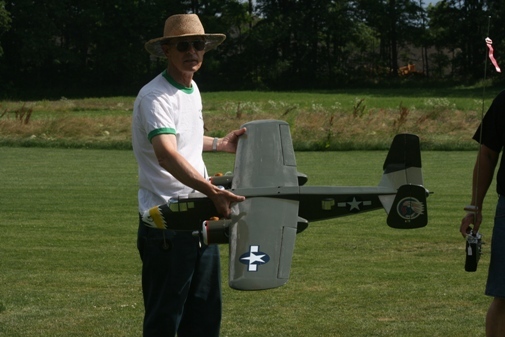 3) Jonathon Rifkin taking off his OS .25 powered Great Planes Corsair..
5) Dan bush with his World Models "Candyman" P-51 Mustang. 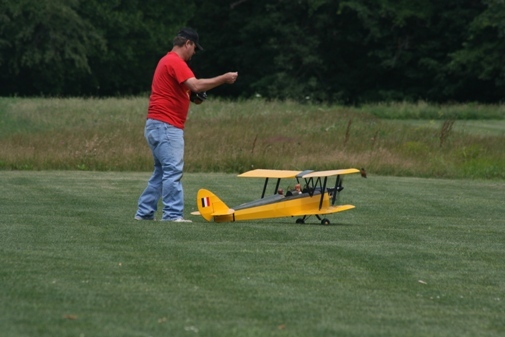 Powered by an OS .46, this is his first plane he built, flies great and fast. 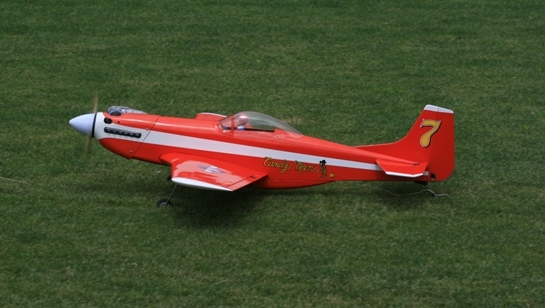 6) Duane Ringo taxiing out his Top Flite Corsair, powered by a G-62. Duane won the Peoples Choice award. L-R: 1)Another shot of Duane Ringo's nice Corsair. 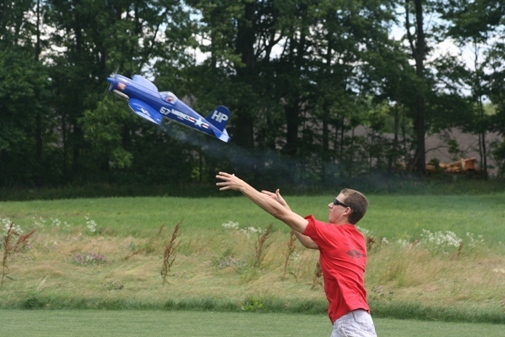 2) Parker Hall flying his Stratus for the new demo. 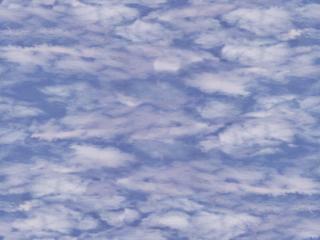 Very good XFC style flight in strong cross winds. 3) Duwanye Lindsey getting the OV-10 Bronco ready for a flight. 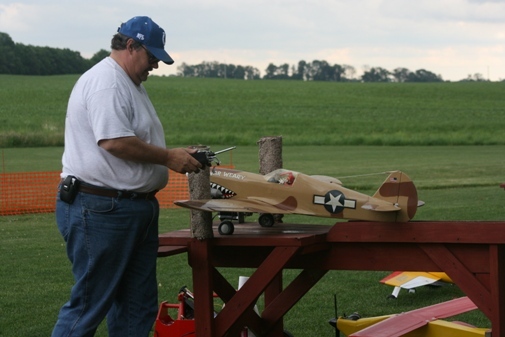 5) Joe Kosiba starting his Top Flite P-40 Warhawk. 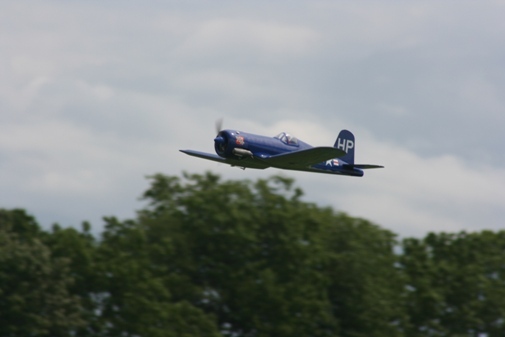 6) Ed Brazzell's Midwest T-6 Texan down & dirty, ready for touchdown. 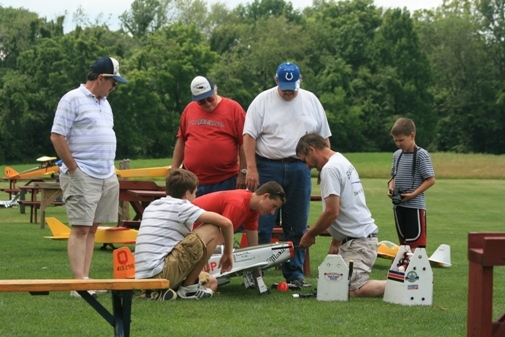 L-R: 1)Pilots Choice winner, Duwayne Lindsey from Terra Haute for his very nice scratch built OV-10 Bronco. Powered by two Saito 1.00 four strokes. 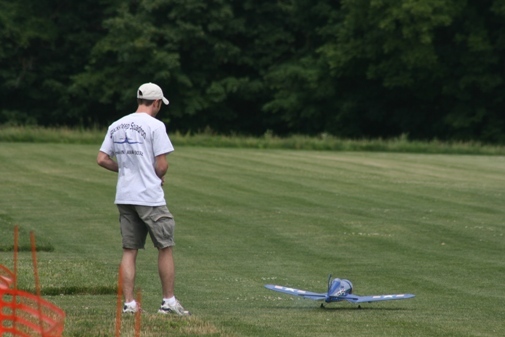 Won 1st in Novice at the recent Mint Julep Scale Masters Fly-In. 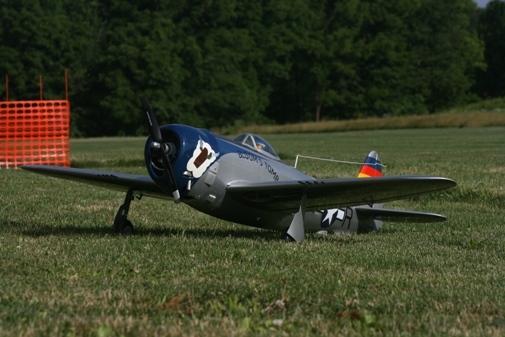 2) Peoples Choice winner, Duane Ringo for his Corsair. 3) Mike Whitmore with a whole crew of help working on his Hangar 9 P-51 Mustang. 4) Raffle winners L-R: Bob Groethe - Hangar 9 Corsair, Tom Carlyle - gallon of fuel, Ralph McBee - glue, Duwayne Lindsey - Blacksheep club shirt, Rafael ? - covering and Alan Oliver - Blacksheep club hat. 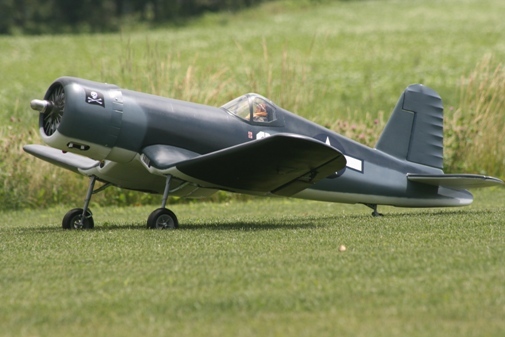 5) Dan Bush's P-51 Mustang taxiing out for it's maiden flight. 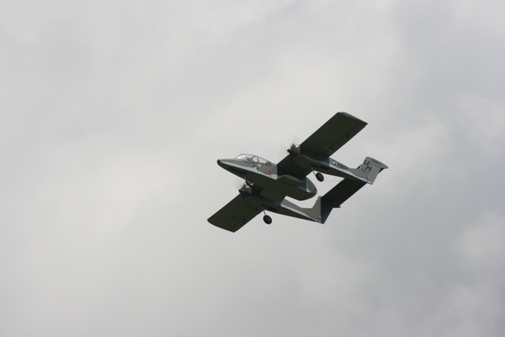 6) Pilots Choice OV-10 Bronco flown by owner Duwayne Lindsey. 7) Rege Hall's Hangar 9 Spitfire. Powered by a Saito 1.00 four stroke. Everyone seemed to enjoy the day, despite the winds and one rain shower. And all said, "let's do it again next year."